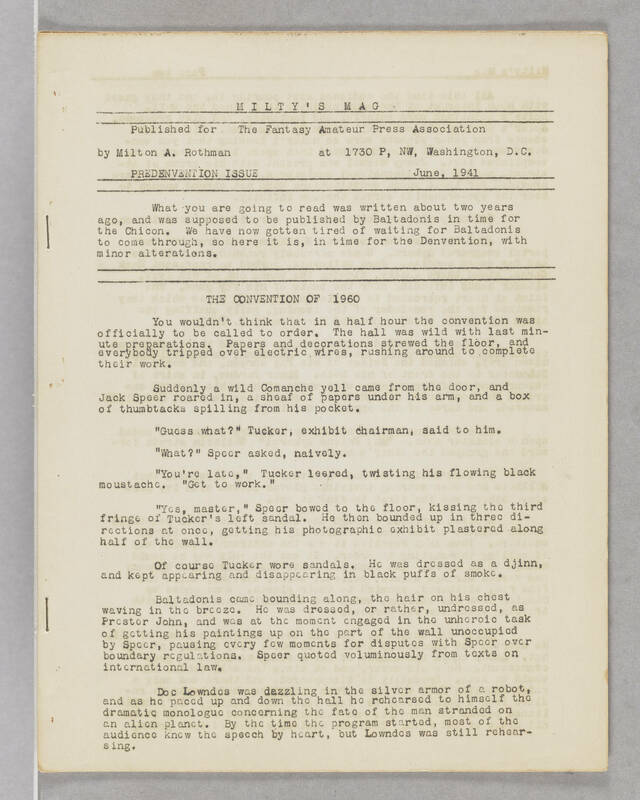 MILTY'S MAG Published for The Fantasy Amateur Press Association by Milton A. Rothman at 1730 P, NW, Washington, D.C. PREDENVENTION ISSUE June, 1941 What you re going to read was written about two years ago, and was supposed to be published by Baltadonis in time for the Chicon. We have not gotten tired of waiting for the Baltadonis to come through, so her it is, in time for the Denvention, with minor alterations. THE CONVENTION OF 1960 You wouldn't think that in a half hour the convention was officially to be called to order. The hall was wild with last minute preparations. Papers and decorations strewed the floor, and everybody tripped over electric wires, rushing around to complete their work. Suddenly, a wild Comanche yell came from the door, and Jack Speer roared in, a sheaf of papers under his arm, and a box of thumbtacks spilling from his pocket. "Guess what? Tucker, exhibit chairman said to him. "What?" Speer asked, naively. "You're late," Tucker leered, twisting his flowing black moustache. "Get to work." "Yes, master," Speer bowed to the floor, kissing the third fringe of Tucker's left sandal. He then bounded up in three directions at once, getting his photographic exhibit plastered along half of the wall. Of course Tucker wore sandals. He was dressed as a djinn, and kept appearing and disappearing in black puffs of smoke. Baltadonis came bounding along, the hair on his chest waving in the breeze. He was dressed, or rather, undressed, as Prester John, and was at the moment engaged in the unheroic task of getting his paintings up on the part of the wall unoccupied by Speer, pausing every few moments for disputes with Speer over boundary regulations. Speer quoted voluminously from texts on international law. Doc Lowndos was dazzling in the silver armor of a robot, and as he paced up and down the hall he rehearsed to himself the dramatic monologue concerning the fate of the man stranded on an alien planet. By the time the program started, most of the audience knew the speech by heart, but Lowndos was still rehearsing.